This page is a good starting point for creating logon scripts for those that want to build a logon script in the Script Editor instead of using point and click in the Home Screen. 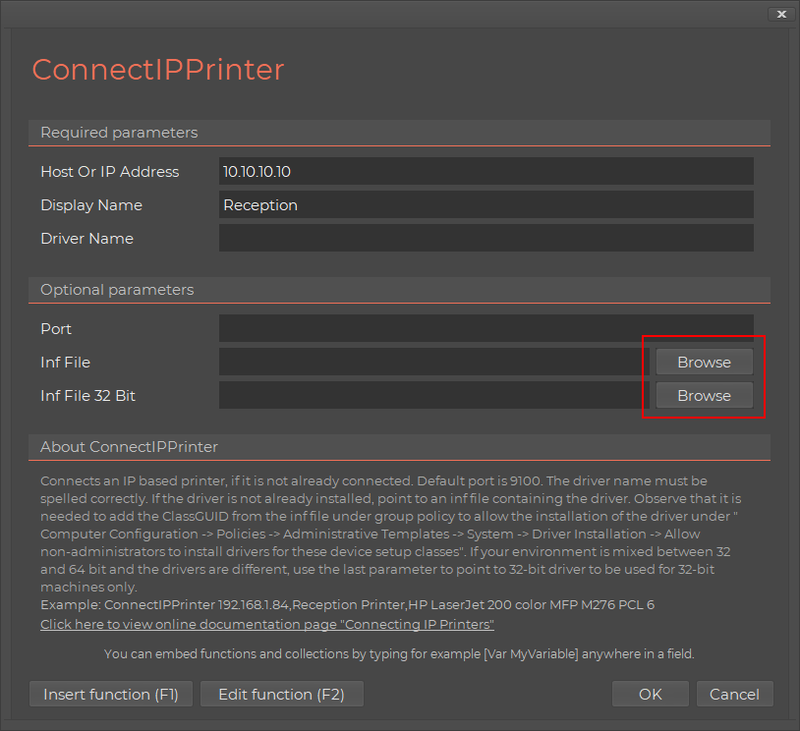 Learn how to connect UNC and IP printers and shares based on Active Directory groups, physical locations or prompting for printers through a graphical printer selection menu. Along the way, some tips and tricks will be presented, for example how to factor in Remote Desktop Services and XenApp sessions, handle virtual machines and how to include inventory of client hardware and software. This page will not go through running backups and automated installations through logon scripts, as these have separate pages. Please have a look at this page for information on running backups at logon and this page for automated installations through logon scripts. Notice the button at the bottom that lets you take over the script in the Script Editor. If you need to write you own logon script in the Script Editor, you can do as much as you can in the Home Screen and then take it over in the Script Editor. - Displayed a nice welcome screen. Optionally, we could have provided a corporate logo as a third parameter. - Connected a common share, the user's personal share and a common sales personnel share. - Connected the two printers at the office. - Synchronized the computers' time. For most companies this is obviously not enough functionality for a logon script. In the next sections, we will look at, how we can add more complex functionality. For a practical example of connecting printers based on groups, please refer to this case study, where a consultancy company also creates a corporate Microsoft Outlook signature and installs standard applications through a logon script. 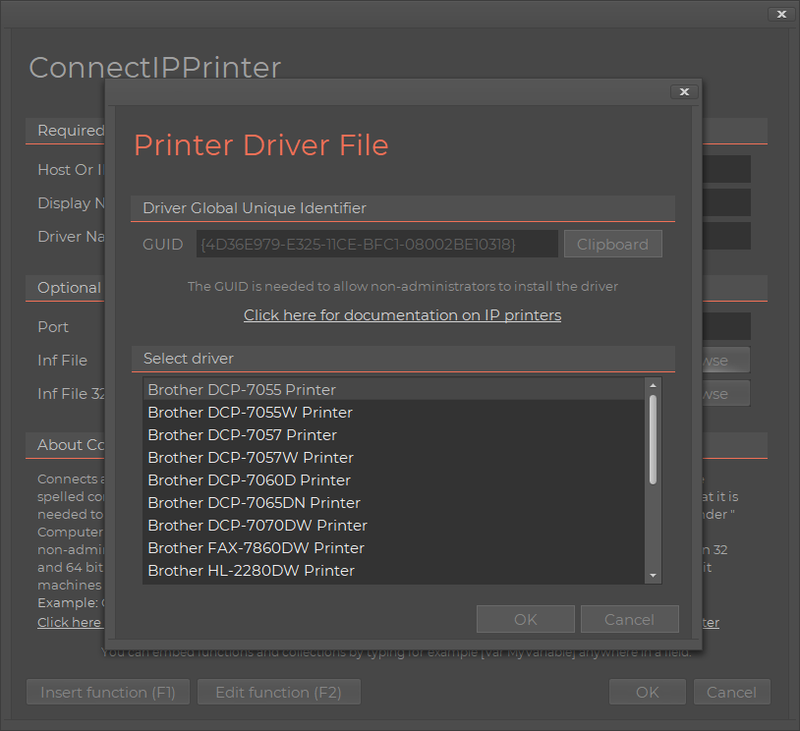 If you use the ConnectPrinter command to connect printers, you may see a security warning, when the driver is going to install. This warning can be removed using Group Policies. Locate "Point and Print Restrictions" under "Computer Configuration -> Policies -> Administrative Templates -> Printers" and set to "Disabled", as shown below. Under Windows 2003, this key exists under "User Configuration -> Policies -> Administrative Templates -> Control Panel -> Printers" instead. These three lines will make life much easier for you. Create a directory called "GroupScripts". For each user that logs in, it will execute all the scripts that have the same name as one of his or her groups. Each file would then contain a "ConnectShare" script line, but you can do more, like synchronizing document templates to the user's documents template folder, or whatever you want done for users in a specific group. And then the printer connection script lines would go into the per-machine group scripts. You can also modify the above examples to do the same based on Organizational Units using the "ComputerIsInOU" and "UserIsInOU" conditions. If we scale up one more time and look at a really big company, a new problem arises. Lots of people have laptops and they roam on different locations. This would not be a problem for a single location company, because the laptop would typically be docked at a fixed location, while at the office. 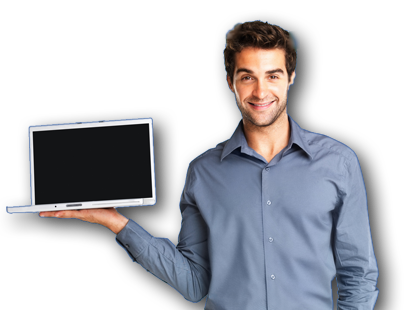 But for larger companies, laptop users may roam on different locations and only have a fixed location at the "home" location. And as the world goes more and more mobile and most computers sold today are laptops and tablets, this "problem" is growing all the time. When a logon script runs in the context of a RemoteApp, this is detected automatically by the scripting engine. Any user interface that would normally be shown, is simply not, because it would stall the RemoteApp foreever. Even if you expand the window that appears at startup, you cannot see and interact with the logon script in any way. If you for example decide to use the option to prompt the user for Outlook Signature data, this pop-up is simply ignored, as will all other user interfaces that requires interaction. In other words, you don't need to handle RemoteApps in general in your logon script. The difference between InIpScrope and InClientIpScope is that the first one simply looks at the primary network adapter on the executing machine. The InClientIpScope condition will try to resolve the "outer most" client. If the script is executing under an ICA or RDP session (remote session), the ip address of the client executing the session is used. If it is not a remote session, the same IP address that InIpScope would have returned is used. Therefore to factor in remote sessions, we can simply use InClientIpScope instead of InIpScope. This same logic to preferably get information on the executing remote client also exists for the ComputerName, IPAddress and IPAddressPart functions. These have similar "outer most" counterparts: ClientName, ClientIP and ClientIPPart. Please refer to this page (ICA version) or this page (RDP version) for more information. If the session is a remote session (RDP or ICA) or the machine executing the session is a virtual machine (Hyper-V, VMware or Xen hypervisor), the script is stopped at this point. The Exit command could also be replaced by an inner script block that is ended with "End If", where for example installations or backups would run. If only a specific hypervisor technology must be handled, the condition HyperV, VMware or Xen can be used instead of the VirtualMachine condition. If a user closes a remote session and then later reconnects, this is normally not a problem. But if the user has changed location in the meantime, the user might need another set of printers. To handle this problem, a free utility called SmartConnect is available to fire a script on reconnection. With this script, you can include the same script snippet you use in your logon script, or if you use Group Policy to connect printers, you can use a script that will automatically reconnect the printers based on the new client name. Refer to this page for more information on SmartConnect. Observe how the selected choice is stored in the registry and is then fed to the "SetMenuDefault" command, so the user could effectively just press return to keep the current printers at logon. There are two versions of all menus, one that forces the user to select and one that allows cancel. In case of cancel, the returned value is blank. If the user then deletes the desktop icon, then it's simply created again at next logon. You may be wondering why the path to the script file is prefixed with the "FastTrackPath" function. We could have created a shortcut to the netlogon location, but the FastTrackPath function will give us the location of the executing fsh.exe and as FastTrack Logon has synchronized the needed netlogon files locally to preserve bandwidth, we might as well use the local copy, located in the local folder pointed to by the "ClientDir" setting in FTLogon.ini. As fsh.exe, prelogon.fsh and our PrinterMenu.fsh script are in the same directory on netlogon, they will also be in the same directory in the client cache and thus the FastTrackPath function will give us the directory of the local copy of the PrinterMenu.fsh file. Further down this page there is an extended version of this script. Be warned though that that example is very advanced and very hard to understand, if you are new to FastTrack. You can map SharePoint folders and/or OneDrive for Business as drive letters, just as you can with UNC shares. Please refer to this page for information on OneDrive for Business and this page for SharePoint folder mapping. With this one command in your logon script, you will have full hardware and software inventory of your computers. SkyBox has no additional cost; it just requires your clients to be licensed and within maintenance period. Refer to this page for more information on SkyBox. The rest of this article contains very advanced logon script functionality that is relevant only to very large companies. If you intend to use some of the material presented further down this page, it is still highly recommended to start by setting up a simpler logon script, based on the above information, to be sure that the basic setup is in order and working. In either case, the below video is highly recommended as a sum-up of the material above. Press play below to watch Senior Technical Writer Steve Dodson from Binary Research International walk you through the material above. Let's go back to one of the previous sections, where we determined location based on IP address. We will be using the ClientIP and ClientIPPart functions instead of IPAddress and IPAddressPart under the assumption that remote sessions exist. If you are using a version of FastTrack older than version 8, these do not exist and the IPAddress and IPAddressPart functions must be used instead. We will go through an advanced version of that, where we use information in an xml-based ip table file instead of using hard-coded ip addresses in the scripts, which is a better solution for companies with lots of IP scopes. This will display for instance "Welcome to ACME Los Angeles" and will then connect the Los Angeles server share, if that's where the user is. You could extend the attributes with more information about the location in the XML file as needed, with just one extra script line being required to get each. So we have established where the user is. 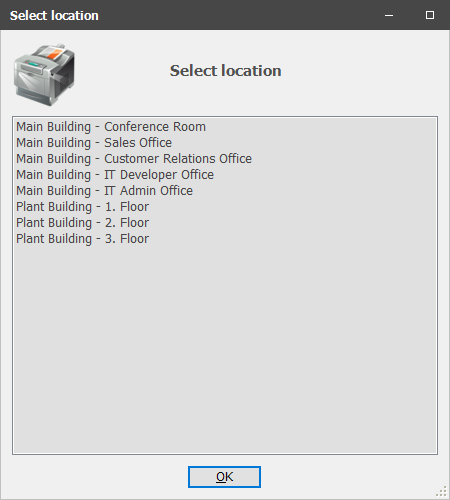 But people at opposite ends of a fairly large building are not going to want to use the same printers, so we need a little help from the user, but we will only trouble them once per location or if they want to change printers within the location. But be careful! A malformed XML file will cause runtime errors, so be careful when modifying the file. This simplest way to test if it is malformed or not is simply to logoff and logon again on a workstation and check that is still shows the location in the splash. 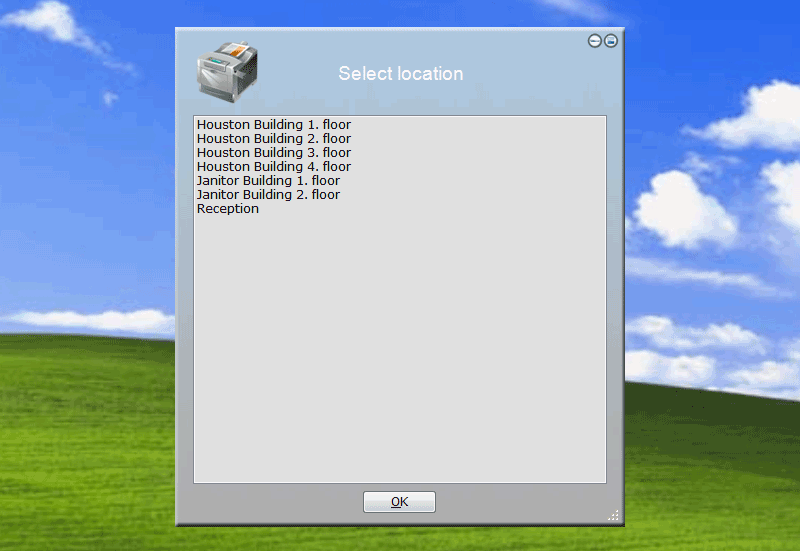 - The first time users logs on at each location, they should be asked which printers they want. 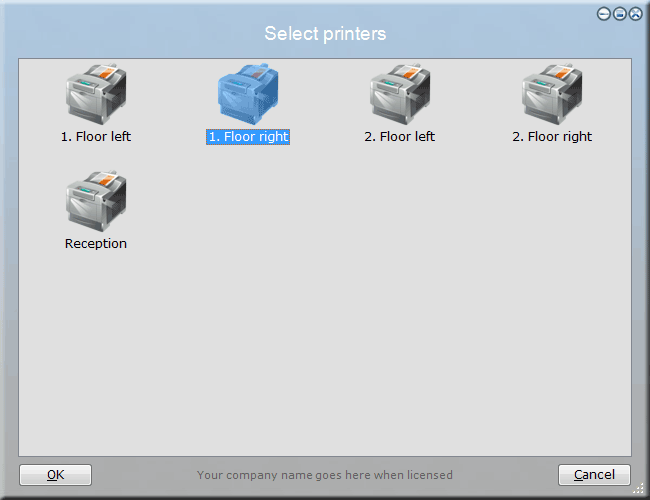 - The user must have a shortcut in order to get the menu again and to re-select printers. - If we change the printers in the list, we want such changes to be enforced automatically on all clients. SetVar PrinterList,"[XMLPairAttribute Locations.xml,[Var XmlPath],Name,[Var PrinterSet],Printers]"
The first printer in the list will be connected as the default printer. Running ConnectPrinter does nothing if the printer is already connected, so we don't need to test if it is already connected. The last line will delete all network printers that have not been through the ConnectPrinter command in this script context, removing all printers from other sites or previous XML settings. Putting it all together, a complete Acme Corporation logon script could now look something like the below. Observe that the RemoteSession condition and ClientIPPart functions require version 8. ShowMessage "You are not allowed to logon through remote sessions, please contact HelpDesk","Error"
IF [FreeDiskSpace]<5 Then ShowMessage "Please contact HelpDesk, you are running out of disk space","Warning"
- Ensured that no one unauthorized user logs on through Remote Desktop Services. - Determined where the user is. - Shown a nice welcome splash screen. - Connected a common share, the user's home share and a location-based share. - Written registry information for other applications about the current location. - For every group the user is a member of, we looked for a script file and include it. - Asked the user to contact the HelpDesk if he is running out of disk space. - Ensured that no one runs at a resolution lower than 1024x768. - Backed up the user's personal folder on portable computers once a week. - Once a week, cleaned up temp. - Once a month, cleaned up temporary internet file folders. - Synchronized the company's common icons to the user's profile. - Applied all needed user settings based on what the user has installed. - Applied user settings once per user for every scripted application. - Automatically handled connection of the user's printers.